Hartel’s Disposal has proudly served our local neighborhood for OVER 65 years! In 1952, Leo Hartel started his independent business, Duluth and Proctor Garbage Service. He operated with the principles of quality service and personal integrity. Leo continued to serve the community until 1985 when his son Dan and nephew Jeff Walstrom purchased the company. In 1995, Hartel’s merged with Darrell B. Johnson’s DBJ Disposal Company, which had served the Duluth area since 1979. The newly created company was called Hartel’s / DBJ Disposal Companies. A new generation of Hartel’s and Johnson’s assumed responsibility in 2017, bringing renewed energy and a clear vision of what today’s marketplace requires. Carl Johnson along with the 3rd generation Hartel’s, Kevin and Valeree, became partners as Darrell and Jeff retired. In 2019, our local company decided on a fresh new look to reflect the Hartel family history, as well as our commitment to community and the environment. Introducing Hartel’s Disposal. A new name and look, but the same reliable local service our customers have come to expect. 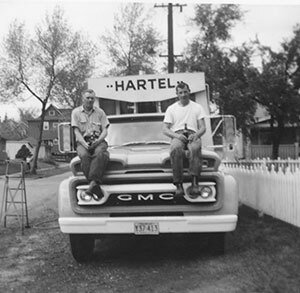 Over a half century later, Hartel’s Disposal is the largest locally owned trash and recycling company in NE Minnesota. While much has changed in our industry and region, the company has retained our old fashioned values of customer service and community involvement. We all work and live in the communities we serve. Most importantly, we keep our money working locally right here in the Northland, which benefits us all! Your Local Choice. Watch our short video.